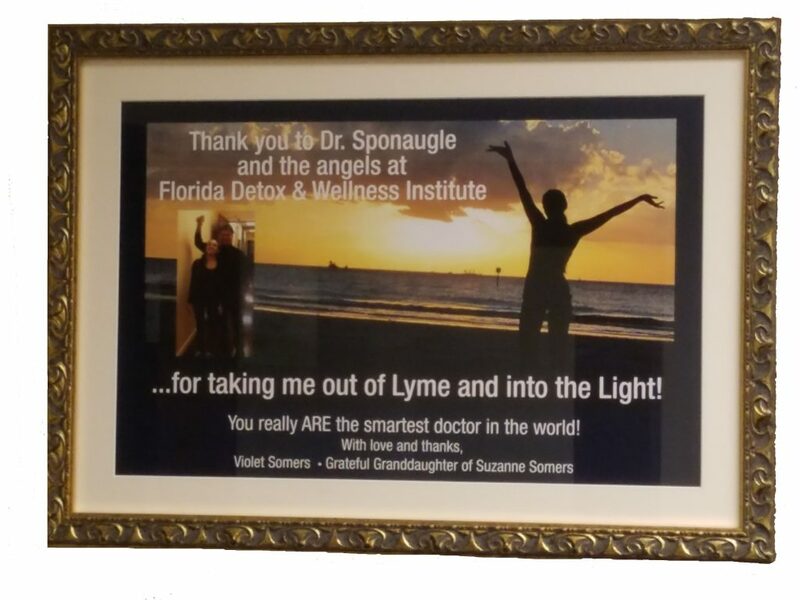 Violet Somers – Granddaughter of Suzanne Somers – Thanked Dr. Sponaugle With This Framed Photo of Her Celebrating Her Recovery at the Beach! It happened to her and took away her quality of life during fun child­hood times when all her fourteen-year-old friends were enjoying normal lives. Instead, Violet was battling an enemy she could not understand. It was heartbreaking to watch and not be able to help. I have asked Violet if she could tell her story in her words, of her journey and the cascade of bodily discomfort and brain disruption that resulted. To say/ love Violet is an understatement. I was anguished watching her go through this horrific ordeal. To hear her tell it will help you to understand what you might be experiencing, or perhaps what someone in your family is going through. SS: Thank you, sweet Violet, for sharing your story. You are six­teen years old, but because of what you’ve been through, you have the wisdom of someone twice your age. VS: I was around thirteen; I only remember that it was an age where I didn’t feel like I could eat anything I wanted anymore and look the same way every day. I couldn’t depend on my body feeling right and I couldn’t depend on my stomach not being bloated. I was also starving … I would be so hungry. As soon as I stopped eating, I would be starving again. It would happen after every meal. It was an insane feeling. I didn’t seem to be in control of myself; I could never get enough. For me it felt like the world was ending. I felt like I wanted my life to be over. I didn’t know what I was going to do, but I was filled with the feeling that everyone was going to hate me and that the worst thing in the world was going to happen. It’s a horrible and awful way to feel. I felt completely out of control. SS: Did you talk to anybody about it? VS: I was too embarrassed, because I felt it was something that I did to make this happen. I was embarrassed that I couldn’t function normally and I didn’t want people to know that I was having trouble thinking. So I withdrew because I didn’t want to see anyone until I looked and felt the· way I wanted to. I stayed home and slept all the time. SS: You must have felt so despondent. It’s a lot of stress for a teen­ager to handle. I remember you were so concerned about your looks changing. What were you seeing? VS: When I would look in the mirror, it looked like my face had turned gray. My face was puffy. I also gained a lot of weight. I could put on fifteen pounds so easily. When I would starve myself, I could lose it, but then when I went back to eating I would put on ten pounds in a week. That’s why I got so scared of food. SS: So now you’ve discovered that you not only have food issues and food allergies, but then you found out you also have Lyme dis­ease. How do you think you got Lyme disease? VS: I went on vacation with my friends to their house in Nantucket. One day I noticed a mark on my leg. It looked like a bull’s-eye. SS: You mean kind of like the Target brand logo? VS: Yes. They took me to the clinic and called my mother and told her it was a Lyme-tick bite and that the only treatment was antibiotics. So I took them. A couple of months after the Lyme diagnosis, I started noticing that my face was very oily, which was extremely embarrass­ing. I would go to class and at the beginning of the class I would go to the bathroom to blot my face, and then two minutes later it was really oily again. It was just another part of my body that was out of control. SS: Who could you talk to about this? VS: I could talk to my mom. We talked a lot about my depression. That’s all I wanted to talk about … Why did I feel so sad? SS: Of course. You went from an idyllic life, a safe life, with perfect health and a slim, trim dancer’s body; and then everything changed. Suddenly you are never feeling well, you are having trouble thinking, plus you have unbelievable fatigue, your face is like an oil well, and you are gaining weight at an alarming weight. I’d feel sad too. VS: Yes. Dr. Sponaugle sent lab forms and after he had all my lab work back, he kept e-mailing my mom and saying all these things about my condition. We both thought he was crazy because we had never heard of this syndrome before. He would use huge words when talking about Lyme and say that it wasn’t gone. In fact, it was nowhere near gone, even though they had already given me antibiotics. He suggested that I needed to come to his clinic for a few weeks. SS: How did you feel about that? VS: Well, it was hard. I had to leave school and my friends and be gone for several weeks. But I wasn’t happy at school; I kept feeling sick and I didn’t want my friends to see me. So it seemed like the only thing that might help me. SS: Tell me about being in the clinic and what that was like on a daily basis. VS: We stayed in a hotel and went to the clinic every day like a job. And it was. My job was to get well. I started getting IV drips of different natural detox substances: glutathione, vitamin C, and a lot of other things. Dr. Sponaugle also gave me a drug to help replace the dopamine in my brain that my brain wasn’t making because of all the toxins in my system. I learned about my syndrome, that the toxins were leaking out of my weak digestive system and making their way to my brain, upsetting and stopping my hormone production; these things that were causing the cravings I had been having for food and the binge eating were because my brain was wanting to get a “dopa­mine hit.” Also, as a result, I was not making serotonin and that was what was making me depressed. SS: That makes sense. Serotonin is your feel-good hormone, and if you weren’t making hormones, that would also add to your depres­sion. You had a real whammy: no dopamine, no serotonin, food aller­gies; you didn’t even know about mold allergies yet, and then the big one, Lyme! SS: You mean you were starting to be able to think again and these were the first questions popping into your head? VS: Yes. I realized that for two years, I couldn’t think! I had thought I was losing my mind. SS: So what did that mean to you that you were asking these ques­tions? VS: I don’t want to analyze it too much, but in that moment it felt like the best feeling of my life. Just to experience normalcy again. I didn’t realize I had been in this kind of space without thoughts. I was starting to feel normalcy again. Then I got scared. VS: I had the feeling of fear that this normal feeling was going to go away. When I was at the clinic, I found I not only had Lyme but also I had mold. I now know that mold is what made my digestive system inherently weaker, which is why I had food allergies in the first place. SS: The puzzle was starting to piece together? VS: Yes. And then when I found out that it was the antibiotics that could destroy my digestive system and make it even weaker, it was hard. SS: Well, yes, you are a kid and when a doctor tells you this -is the treatment, you do it. VS: Right. But for me antibiotics were ultimately the wrong thing. I didn’t know that I already had mold and food allergies and that the antibiotic was going to make it so much worse. SS: Of course, you wanted your life back again. VS: Yes. I told Dr. Sponaugle to do as much as possible with as much power as he had in his arsenal because I wanted to get better as fast as possible. VS: I guess so. But it created a lot of anxiety. We were bringing up the toxins and it made me feel crazy. But I kept on … I embraced as much detox as he could give me because I wanted to get well. I wanted to be well more than anything, and it was the only thing that mattered. SS: Did you miss your friends? VS: Yes, but not like you would think. I missed them but didn’t want to see anyone until I was all better. SS: That’s so sad. I feel so badly for you. What did you feel like physically when you were going through all of this detox? VS: I felt like I had the flu: I had headaches, the nausea was real bad, I threw up in the car on the way there a couple of times. I had unbelievable fatigue and deep depression. The depression and the anxiety made me so scared; I talked to Dr. Sponaugle about it. He re­assured me that this was supposed to be happening and it was part of the detox. He also explained that the mold allergy had made me much more susceptible to the Lyme. Like a person who didn’t have mold or allergies wouldn’t have been hit so bad by a Lyme bite. A person with­out these issues might have a much lower chance of having such a se­vere reaction. Because of the mold, the food allergies, and my already weakened digestive system, I also found out another thing; I carry the gene for the mold allergy and that made me much more susceptible to all of it. Some people get Lyme and it doesn’t bring_ them down like it did for me, but I had all these other things going on. SS: Right. Our family carries the HLA gene, which heightens peo­ple’s responses to toxins. So how long did you stay in the clinic and what was it like when you went back to school? VS: I stayed in the clinic for six weeks, although the doctor wanted me to stay longer. He said I was much better but I wasn’t well. But I wanted to go back home. I was so happy to see everyone and so happy to be feeling better than before when I left school. SS: I love you, Violet. Thank you for sharing your story. Today when I am with you, my heart soars with happiness to see you well and functioning normally. I am very proud of you, and I also think you are very brave. Your story is going to help so many. VS: I hope so. I now know, if l choose the wrong food, I am going to have a setback. I look at food as the battery for my body; it’s what makes it run. If I want it to run in top form, then I have to put top-quality food in it … getting well just takes a lot of patience. I love you, Zannie. As you’ve just read, the journey to wellness not only involves the affected child but also the entire family. I have asked my daughter-in-law to explain the trauma and unbelievable stress placed on parents trying to unravel the puzzle of fixing and healing a child or children made ill by today’s mystery illnesses that are chemically induced. Car­oline is a magnificent woman: unbelievably smart and capable, beauti­ful, and an incredible wife, mother, homemaker, and businesswoman. She is also executive vice president of our company. I love her like my own and also have a fantastic mother/daughter/business relationship with her. But over the years while going through this horror, it was painful to watch Caroline change from an upbeat, happy-go-lucky, positive person to a mother in constant distress. Her mood changed, her face became serious, and no one was able to comfort her. Her focus, and all she wanted, was wellness for her girls. Tax-sickness is a family disease and has serious ramifications for the whole household. I feel like I’ve been at the heart of a mystery for the last seven years. Both of my amazingly healthy daughters, who danced three hours each day, became ill in their teenage years. I have been chasing the cure ever since. Camelia’s trouble began when she was thirteen. Migraine headaches, stomach cramps, unexplained weight gain, and facial swelling were the key indicators that something was definitely not right. A food allergy and intolerance test was the first piece of the puzzle: she was allergic to glu­ten, dairy, eggs, soy, beans, most nuts, mushrooms, pineapple, peaches, and many more. She cut out these foods, but her symptoms persisted. How could this poor kid who was not eating any processed food still be bloated? On top of dancing three hours every day? Simultaneously, her anxiety was through the roof. People told me it was normal for teenage girls to gain weight and have anxiety. This was NOT normal. I knew we were missing something … it was like she was allergic to all food. Two years later, Violet began experiencing similar symptoms-also at that critical age of thirteen. Food allergy and intolerance tests revealed similar foods that needed to be eliminated-gluten, dairy, eggs. Allergies can be consistent in families, we were told. Violet was diligent-and yet the unfair bloating began to plague her the same way it had with Cam­elia. Violet took to eliminating most food as the only way to control her body. While it helped with the inflammation, this created new problems with lack of nutrition, fatigue, and depression. So I had one with anxiety through the roof and the other who was retreating and depressed. They were both hanging on by a thread. I needed more answers. In the summer after her fourteenth birthday, Violet took a trip to Nan­tucket and almost immediately called to tell me she had a bite on her leg that had been identified as Lyme. A course of strong antibiotics was rec­ommended. I knew this would wreak havoc on her already sensitive intes­tines, but even my anti-aging doctors told me not to mess with Lyme and that se needed the antibiotic. By the end of the six weeks of antibiot­ics, Violet’s body was not able to digest food. She would be swollen and bloated, even when she was only eating foods to which she was not al­lergic. She was despondent, trying so hard and still not able to control her failing system. We met with several specialists, but none could help her. I was out of options … but held out hope for one more doctor I had been speaking with about Camelia’s ongoing issues. He was recommended to Suzanne by Brenda Watson, and Brenda thought he could unravel Cam­elia’s intestinal issues along with the anxiety. But he was in Florida and I wasn’t ready to pull Camelia from school. He was also a Lyme specialist. So when Violet’s Lyme treatment failed her body, we packed our bags for Florida. Violet spent six weeks with Dr. Rick Sponaugle at the Sponaugle Well-ness Institute. When she arrived, he said her immune system was rav­aged. She still had Lyme, and he uncovered the core of the health issues for both of the girls … a genetic allergy to mold. The mold allergy eats away at the intestinal lining, creating holes in the intestines until you have leaky gut syndrome. This allows all food to enter the bloodstream undi­gested, which is viewed by the body as an enemy. All of your body’s re­sources go to fighting this enemy, leaving your immune system depleted. They really were allergic to all food, because their intestines were in such bad shape. And in the process, you may experience high levels of inflammation. Bingo! No wonder eliminating the allergy foods was still not eliminating the inflammation! Their leaky gut syndrome was not healing because of the mold allergy. He also explained that having the mold al­lergy made Violet more susceptible to Lyme. Many people may get tick bites and never have symptoms of Lyme because their immune system is strong enough to keep the Lyme suppressed, but Violet was in such a weakened state, the Lyme took hold of her immediately. Dr. Sponaugle was the first doctor to explain the connection of the damaged intestine and how it had blunted Violet’s hormone produc­tion and created neurological issues. She has none of the hormones a girl her age should have to regulate her moods. No wonder she was so depressed. And the intestinal damage had also blunted her produc­tion of neurotransmitters-she was not making serotonin, dopamine, or taurine-none of the feel-good neurotransmitters for contentment, hap­piness, or joy. In addition, she had developed ADD (quiet type) so she had a very hard time focusing (and Camelia has AD HD-hyperactive type, which explained her anxiety). The mold created leaky gut, which created leaky brain, and the Lyme shut down the rest of her immunity and neuro­logical function-so much brain fog. He said that had it gone untreated, she would likely have been diagnosed with MS within the year-and no one would have known the source. The treatments at the clinic were not easy, but Violet wanted to ac­complish as much as she could in the time we were there. As they un­dergo the process of extracting Lyme and mold from the body, patients range from extremely anxious to extremely depressed. Watching her go through this was excruciating, but she had a singular focus to get well. And at least we now knew the enemy! Violet asked Dr. Sponaugle to give her as much treatment as she could handle. On some nights the anxiety was so bad she was raging and suicidal. Then we would back down. On other days her depression was so bad I could barely move her from bed. Removing the host of toxins from her system was very hard on Violet, but once they were gone, she would feel relief and clarity, until the next treat­ment. At the end of six weeks, she was a different person. Her moods were much more even. She was in control of her body. She was eating very carefully-100 percent organic and had decided to go vegan to assist in digestion. Over the course of the next two years, she has been in and out of school. We decided her health is most important-and ended up placing her in a homeschool program so she could focus on her health. Her body’s normal functions are returning. She started eating meat again, which in­creased her energy level and brain function. Her intestine is dramatically improved so that she no longer experiences inflammation, except on rare occasions. If she gets a moment of anxiety or depression, she knows how to push it away. While these debilitating issues tried to bring her down, the creative artist in her spirit emerged. Violet is finally back in school, at Los Angeles County High School for the Arts-a brand-new building (no mold!) and a place where she is free from the anxiety of overwhelming academics. She spends time with her friends, creating art, smiling, and laughing along the way. And she can study and focus! She’s finally in charge of her health now. Camelia is off at her first year of college. She is also in charge of her health. Her intestines are greatly healed and rarely have bouts with inflammation. We even convinced the cafeteria in her dorm to prepare organic meals for her. Her life depends upon it! Lyme and mold are never really gone from your life. You learn to manage them. Healing the intestines takes time, months and months, but with healing comes mental clarity and happiness. The Lyme ended up being a great gift. It led us to the root cause of the mold-and gave us the infor­mation to heal both of the girls. If you or your children are having mystery illnesses, bloating, depression, anxiety, OCD, ADD, ADHD, symptoms of arthritis, chronic fatigue syndrome, and more, I highly recommend you visit SponaugleWellness.com. Don’t expect miracles in a couple of weeks. These are chronic illnesses that take a lifetime of management … but Dr. Sponaugle was the one who connected all the processes of the human body-how the intestinal system is connected to the hormonal system to the neurological system. I am forever grateful to Suzanne and Brenda Watson and Dr. Sponaugle for helping us unravel this mystery.